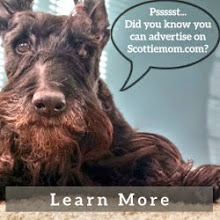 Ok, so you've opened up your home to a Scottie and given him or her the best gift you can offer: a loving Scottie Mom (or Dad!). Now what? For this Scottie Mom, one thing remains high on my priority list: a backyard for Mr. K to call his very own. When I first rescued him, Mr. K didn't have much interest in yards and insisted on being close even when he wasn't on leash but he's opened up a lot more in the last year and has become willing and sometimes even eager to try new things. 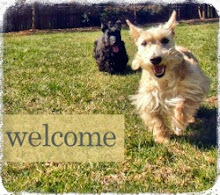 He's come to love the backyard time at Scottie Grandmadre's house and was so very quick to join the Scottie Security team with friends Syd and Oz when we visited their yard, which leads me to believe that nothing could make him happier than having a backyard to call his own. I know dear Heather wouldn't mind it, either - give her a fresh patch of grass to roll around in and you've got yourself one very content Scottie! For Mr. K, though, having a backyard isn't about the grass as much as the ability to keep an eye on things for the family. Even in the house, his favorite spots are the ones near windows, preferably where he has a clear view of things going on below. He's the guardian of the household, after all - especially when Scottie Dad travels - so why not give him land of his own to oversee and protect? Love the pictures! Mr. K looks very proud overseeing his domain! Not only that, you need space to do your own digging, er, I mean, landscaping. I love the garden we have. Raffles does too but he is trying a bit of 'landscaping' himself which is not going down too well with The Director! He'll learn - look, roll, run but do not dig. WOW ! Your own Scottie Guard!! My Plutonio's favorite spots in the house are also windows that allow him to see what is happening outside... Let's wait for the day that "Mr. K's backyard plan" comes true!! I imagine that that day he will be in his own paradise!!!!!!!!!!!! @AbbyMcScottie definitely does a "perimeter check" around the backyard fence to keep out those evil squirrels. She also gets to do LOTS of sniffing, and some nice back scratchies on the grass.